Macy's Makes Online Shopping Easy! Trends can be just that, trendy. And who want’s to spend money on something that’s going to fade away as quickly as it came in? Luckily, this season there are four fall fashion trends that every woman of every age can embrace. And the best part? They embrace some of the best fashion fashion finds from past seasons, which means they will also last beyond this fashion season as well! Now let me ease your fears before they start – you don’t have to get all dolled up in each of these trends from head to toe just to go grocery shopping. They key lies in picking one element at a time and making it work for you. Yes, I know – I started with the most controversial of the fall fashion trends. But hold tight; I’m not saying to go out in head to to fur. 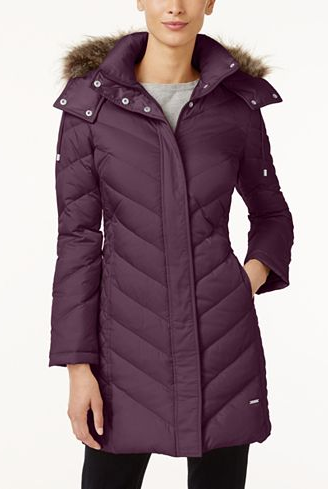 What I am suggesting is picking up a classic piece with faux-fur accents, like this Kenneth Cole Faux-Fur-Trim Chevron Quilted Down Coat (particularly in the Concord color). I learned a few years ago that a great winter coat is so important because if you spend any time outside during the cold weather months, this is what people are seeing you in first and this is what will end up in all those Facebook pictures that get circulated over the holidays! So what am I saying? Don’t be afraid to go bold and fun when choosing your winter coat this season. These Material Girl Juniors’ Contrast Flocked Textured Leggings (found only at Macy’s) are perfect to pair with your favorite tunic and booties. And don’t let the fact that these are found in the Juniors’ department throw you off; even over 40, I find some of my favorite basic pieces in the Juniors’ department and can typically do so at a great value! This piece not only shows how to subtly feature the gold metallic trend, but it also highlights the velvet trend I just showed you. The NY Collection Plus Size Metallic-Trim Velvet Fit & Flare Dress embraces the best of fall in a subtle yet elegant way. I LOVE a good fit and flare dress and it’s flattering on practically any body type. This final trend is the one I truly wish I’d taken advantage of last fall and I’m SO glad it’s made a return in 2016: the bomber jacket. 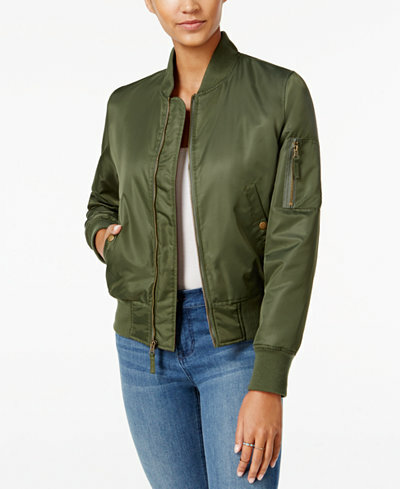 The best part about the bomber jacket is you can pair it with a white t-shirt and dark jeans and it automatically makes you look stylish even though you’re comfortable at your core. And with color choices like Black and Dusty Olive, you can’t go wrong with either of these fall neutrals. There you have it: four fall trends every woman can embrace and work into their wardrobe. Which fall trend are you most excited to try (or are already rocking in your wardrobe right now)?